We created this bespoke jacket for a client who likes his outdoor pursuits; it’s perfect for hunting, shooting, fishing, and maybe even a bit of parkour or extreme free climbing, should he want to turn his hand to that. It was inspired by a US military M65 field jacket, while the side pockets were suggested by those found on a 50s Duxbak hunting jacket, and are copious enough to store any bagged mallard (creative workwear appropriation? It’s water off a Duxbak to us). 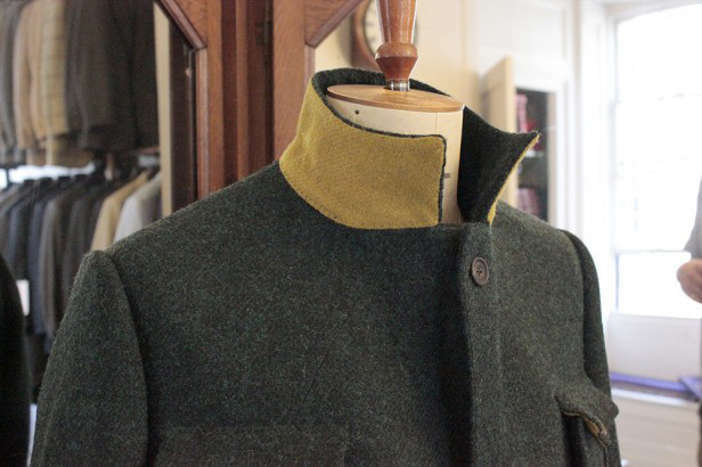 The sculpt facing was completely hand-finished, and the bellows pockets, perfect for stockpiling collapsible hunting horns, cartridges, or coy carp bait, are contrast-lined in yellow Harris tweed, as is the Melton undercollar. It’s not only the game that’ll be hung up with pride when he gets home.